On June 4, 2010, John Butler Trio played the largest headlining concert of its career at the majestic Red Rocks Amphitheater in Morrison, CO, joined by Native American dancers and an electrified crowd. This 3-disc box set package features two audio CDs and one 140-minute full-length DVD that includes the entire, uninterrupted concert, behind the scenes footage and the official video for ‘Revolution,’ the epic opening track from Butler’s ‘April Rising’ (2010). 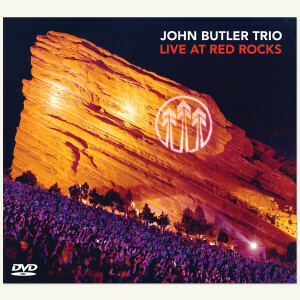 ‘Live at Red Rocks’ highlights Butler’s prodigious guitar skills, powerful songwriting and the transcendental live performance he delivers with Byron Luiters (bass) and Nicky Bomba (drums). It showcases the innovative, rhythmically complex, diverse and playful sound that has garnered the JBT a devoted fan base worldwide. This CD/DVD is an amazing package. Nothing beats The John Butler Trio live and the nice thing is that the you get a CD. Very good quality to add. If you are a JBT fan this is a must. JBT is truly an authentically creative band with the perfect amount of versatility that keeps true to their sound and it really shows in this Red Rocks CD/DVD.